That Idea or Project in your head you do not know how to go about it, talk to us. We will help you clarify if, identify your obstacles to execution and help you begin very powerfully. Our clients include: Companies, Small businesses, Churches, NGOs, Project Managers, Event Planners, Personal Brands. Our services are highly affordable because our clients are mostly businesses and Organizations in their early and small stages which we work with to move up in the scale of relevance. We derive Joy in seeing our Clients progress to the NeXt phase in their Most Cherished endavours. For Business and enquiries call or Whatsapp. 07030888967, 09020533627. Or send a DM. 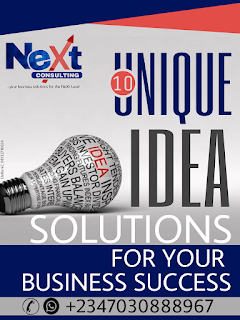 NeXt consulting...Your Business solutions for the NeXt Level.